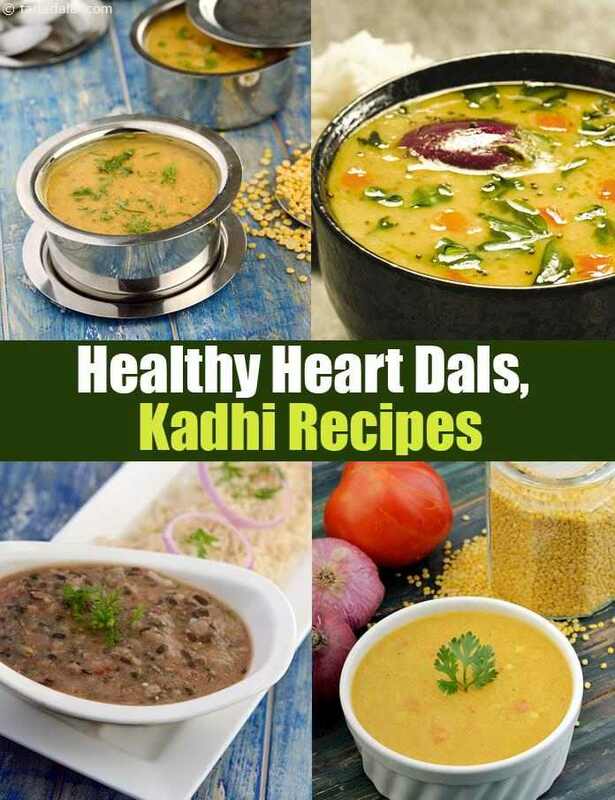 dal kadhis for a healthy heart. Dals and Kadhis make a great part of our lunch or dinner. When it comes to dals and kadhis, we often think about fat-laden tadkewali dal and creamy kadhi with deep-fried pakodas, and for this reason we often abstain from these nutritious dishes, losing out on their share of protein too! This section shows you how to fix up perfectly heart-friendly dals and kadhis Recipes in this section are not only low-cal and low-fat but are also loaded with other nutrients like protein and calcium, which help keep the heart fit and healthy. Did you ever think that you could make dals using whole legume? Cooking whole legume can add extra fibre to your dal so here’s a recipe of Whole Masoor Dal, apart from having fibre this recipe also gives fair amounts other heart protective nutrients like calcium, magnesium, phosphorus, potassium and zinc. Enjoy this healthy low fat Rajasthani Dal with baked baati. Combine beans and legumes to make your dals nutritious like Rajma and Urad Dal an excellent source of folic acid and fibre. You can also try adding dahi to your dals and make it protein rich like in our recipe for Dahiwali Toovar Dal. Kick out the unhealthy pakodas from your kadhi and give a nutrient boost to it by adding healthy ingredients like Tomato, Radish, Leafy vegetables, Sprouts etc. Palak Kadhi may sound odd but looks very attractive because of the colour imparted by palak. It is low in calories and contains 0% cholesterol, rich in Vitamin A, Folic Acid and Vitamin C. Radish Koftas in Kadhi recipe uses a simple combination of radish and low fat curds, and the koftas are not deep fried and steamed in the kadhi adding more value and making your meal heart friendly. Sprouts Kadhi is a protein and calcium rich recipe good for hypertensives too as it is low in sodium. Enjoy our dal kadhis for a healthy heart and other healthy heart recipes articles below. Rajasthani delicacies are traditionally laden with ghee but not to worry, for here is a healthier version! chana dal helps to thicken the dal and imparts body to the dish. Add amchur as per your taste, more if you like it sour, else just a little.